Company of Artisans was formed in 2008 to enable us to showcase all that we offer – historic building crafts demonstrations, Tudor and Medieval demonstrations for schools, tile making, creating displays for museums and a wide range of arts for schools and community events. 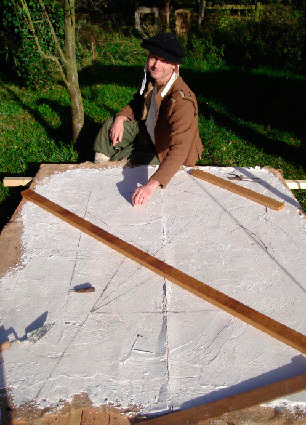 Charlie Slade brings his 11 years experience as a buildings conservator and Karen Slade brings her 24 years experience as an artist and re-enactor to our presentations, ensuring that they are well researched, accessible for all ages and abilities and most of all, fun to take part in. Our activities are always advertised as ‘Join in’, ‘Have a go’ and ‘Hands on’ which encourages everyone to engage and get involved. We develop arts workshops for local councils and museum services for local events, Family Learning and libraries, as well as arts for schools, either as single days, small projects or as artists in residence. We have experience of developing and delivering highly successful and popular training courses in both creative arts and history subjects. We offer these to individuals, organisations and schools. After graduating, I began working in 1997 as a Buildings Conservator on a wide range of properties, from Highcliffe Castle and the British Museum to restoring church buildings and cottages. I enjoy sharing my passion for buildings and experiences with people through the workshops I have developed to show how these buildings were made. My demonstrations allow children and adults to get involved while learning about building methods. Many members of the public enjoy asking me questions about their own houses or local churches and often share their own experiences as retired or working craftsmen. I trained as an illustrator at Brighton and started taking part in re-enacting Tudor life at Kentwell Hall in 1988 as soon as I graduated. My twin loves of art and history have enabled me to work all over the UK since the beginning of 2000 and I enjoy helping people to develop their creativity. I enjoy working with children and adults and began working as an artist in schools after I volunteered for 18 months as an artist at a school for children with special needs. My experience as an artist in schools has helped me to develop professional development courses for teachers. 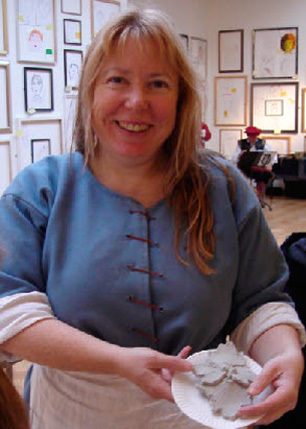 I began making medieval tiles at Kentwell Hall in 1996 and I’m known as Kate Tiler when I am in costume. Tiles are a passion for me and I feel very fortunate to be able to work doing something I love.